Listed in "Who's Who of American Artists and Who's Who of Women, Wini founded Smart Studio Art Gallery in Northeast Harbor in 1967 and the Smart Studio Gallery in Boca Grande in 1982. 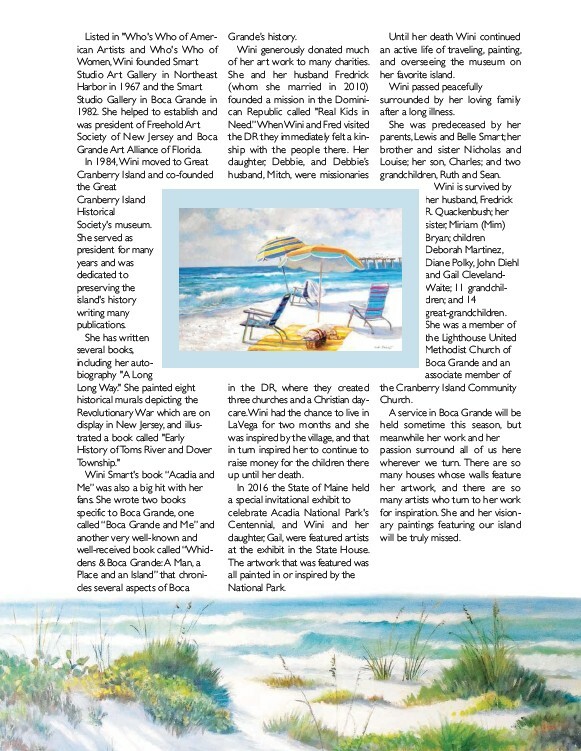 She helped to establish and was president of Freehold Art Society of New Jersey and Boca Grande Art Alliance of Florida. In 1984, Wini moved to Great Cranberry Island and co-founded the Great Cranberry Island Historical Society's museum. She served as president for many years and was dedicated to preserving the island's history writing many publications. She has written several books, including her autobiography "A Long Long Way." She painted eight historical murals depicting the Revolutionary War which are on display in New Jersey, and illustrated a book called "Early History of Toms River and Dover Township." Wini Smart's book “Acadia and Me” was also a big hit with her fans. She wrote two books specific to Boca Grande, one called “Boca Grande and Me” and another very well-known and well-received book called “Whiddens & Boca Grande: A Man, a Place and an Island” that chronicles several aspects of Boca Grande’s history. Wini generously donated much of her art work to many charities. She and her husband Fredrick (whom she married in 2010) founded a mission in the Dominican Republic called "Real Kids in Need.” When Wini and Fred visited the DR they immediately felt a kinship with the people there. Her daughter, Debbie, and Debbie’s husband, Mitch, were missionaries in the DR, where they created three churches and a Christian daycare. Wini had the chance to live in LaVega for two months and she was inspired by the village, and that in turn inspired her to continue to raise money for the children there up until her death. In 2016 the State of Maine held a special invitational exhibit to celebrate Acadia National Park's Centennial, and Wini and her daughter, Gail, were featured artists at the exhibit in the State House. The artwork that was featured was all painted in or inspired by the National Park. Until her death Wini continued an active life of traveling, painting, and overseeing the museum on her favorite island. Wini passed peacefully surrounded by her loving family after a long illness. She was predeceased by her parents, Lewis and Belle Smart; her brother and sister Nicholas and Louise; her son, Charles; and two grandchildren, Ruth and Sean. Wini is survived by her husband, Fredrick R. Quackenbush; her sister, Miriam (Mim) Bryan; children Deborah Martinez, Diane Polky, John Diehl and Gail Cleveland- Waite; 11 grandchildren; and 14 great-grandchildren. She was a member of the Lighthouse United Methodist Church of Boca Grande and an associate member of the Cranberry Island Community Church. A service in Boca Grande will be held sometime this season, but meanwhile her work and her passion surround all of us here wherever we turn. There are so many houses whose walls feature her artwork, and there are so many artists who turn to her work for inspiration. She and her visionary paintings featuring our island will be truly missed.